I’m only… almost three months late with this post. Whoops! 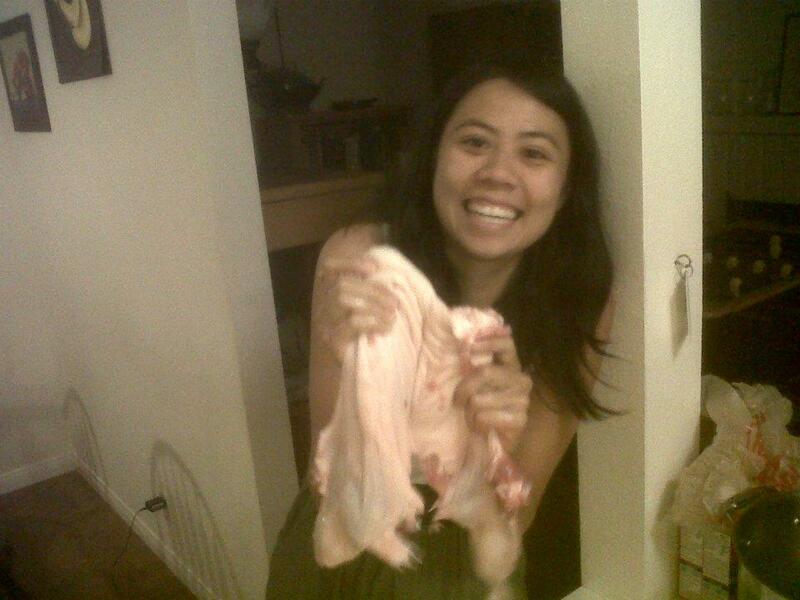 Honestly, deboning the turducken birds is hands down my favorite part of Memorial Day Birthanksgiving. It takes about two hours to do the chicken, duck, and turkey, but with more practice I think it’ll only be an hour and a half next year. 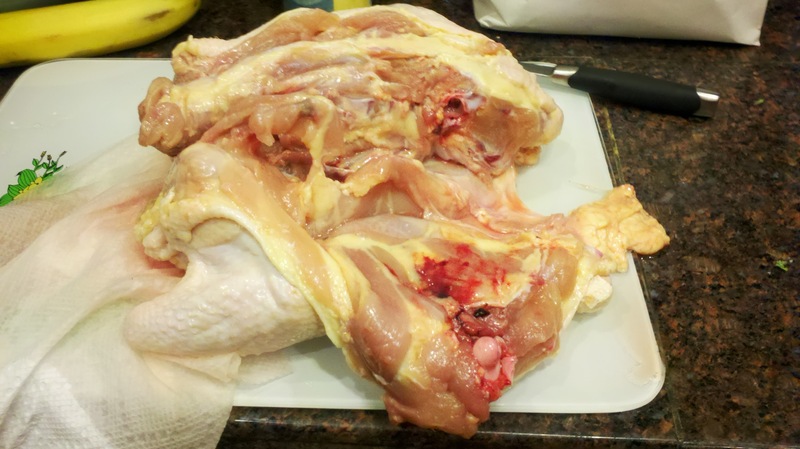 This post is not a definitive guide to carving a turducken, but it might be helpful as an aide. Be warned, this post is very graphic. 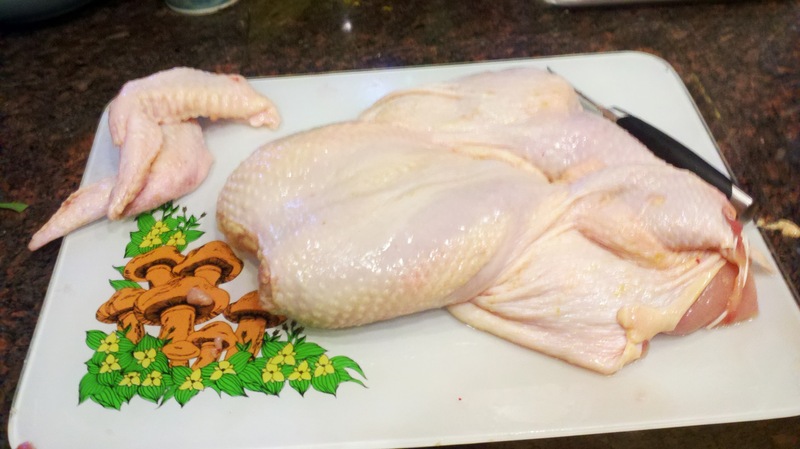 If you’re a meat-eater, I highly suggest deboning a bird sometime- it gives you slightly more appreciation for the meat, and you hopefully will waste less of the bird (I guess meat manufacturers probably turn the leftovers into sausage or something) with your chef’s treats. 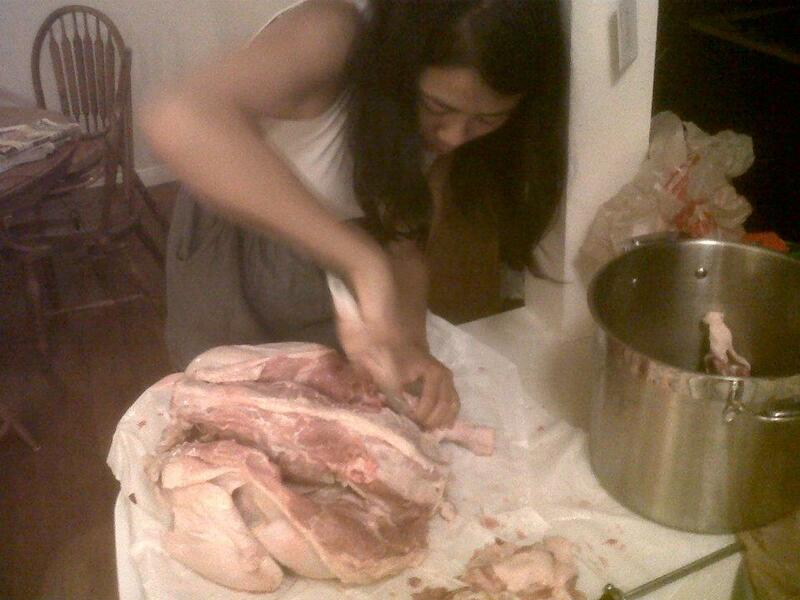 I would love to do some actual butchery someday. 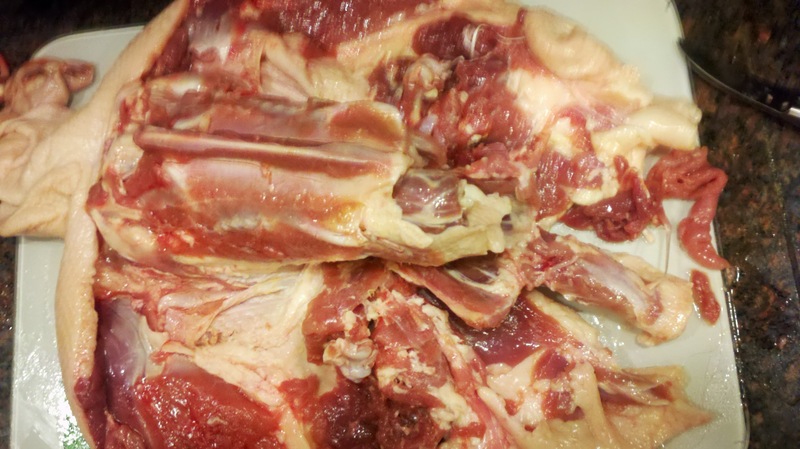 If you are not a meat-eater, and/or are squeamish, you may want to skip this post. Okay to refresh where we’re at: we have three birds. The duck is frozen but will thaw quickly in the cooler filled with cool water, refreshed every few hours, and the chicken is fresh. 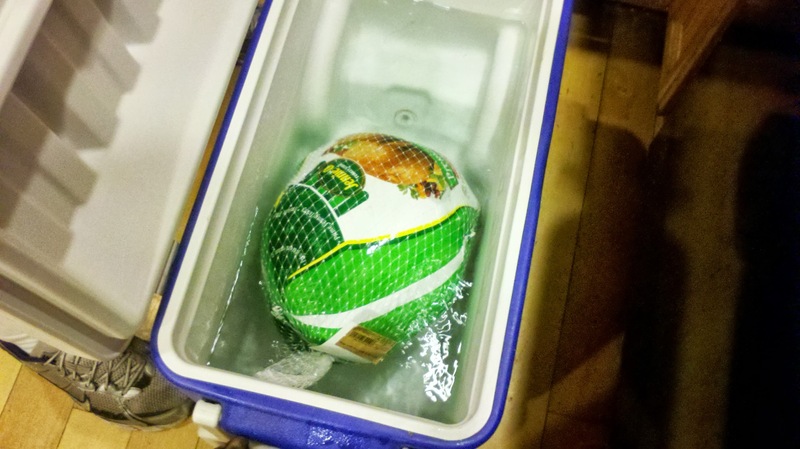 The turkey will take a LONG TIME to thaw. Remember this. Basically I’m trying to make this part of the post longer so the squeamish can click away before seeing lots of cutting of flesh. 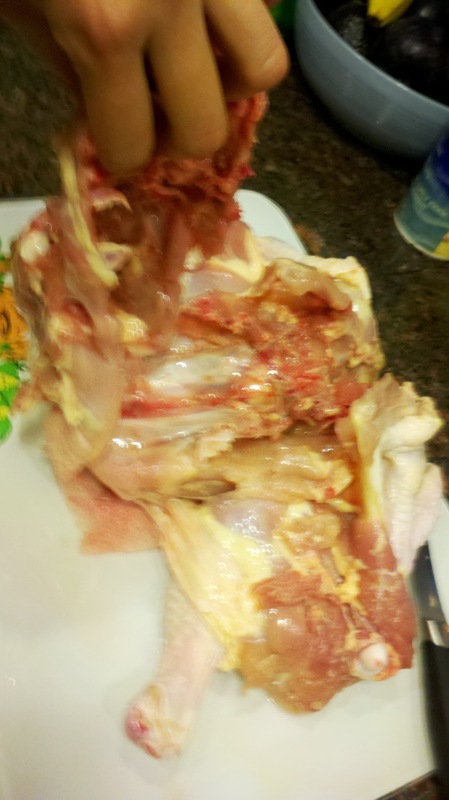 The overall goal of the turducken: remove all the bones from all the birds, except for the wing tips (just cut those off) and the turkey drumsticks. This allows us to roll up the birds together for the end. I found this series of youtube videos the most helpful. There are lots of videos out there to debone birds but I liked the music in these and they are short and have good captions. I have a very poor attention span when it comes to online videos, so these sped up versions of the actual deboning are perfect. To be honest I didn’t watch the turkey one because I saw the chicken and duck ones. Cut down the spine of the bird. Loosen the meat off the rib cage. Pop the leg to cut through the cartiledge. Pull out the entire rib cage (you have to do more precise cutting here to get along the breast without cutting the skin). Remove the thigh bone! It’s so much fun to pop out! 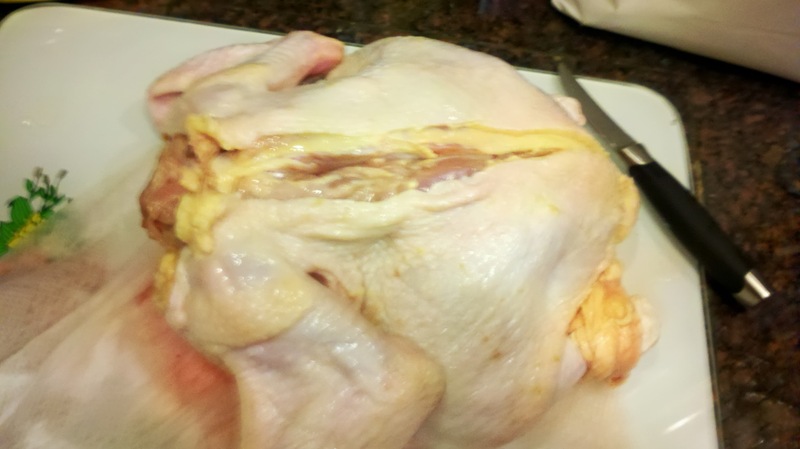 For duck and turkey, remove the knee bone that’s missing in chickens. Cut off the wingtips, deglove the drumsticks (this part is hilarious). You have to carefully cut the cartilidge here- bone is way hard to cut and the tendons are so much easier! You’re done with that part! Now scrape and dig to remove the wishbone. Honestly there’s probably more bones that I’m forgetting. It’s the same idea: scrape and dig, scrape and dig, cut through all the tendons you can find, pop the joints. OK let’s think about the old vice president and get our gore on! 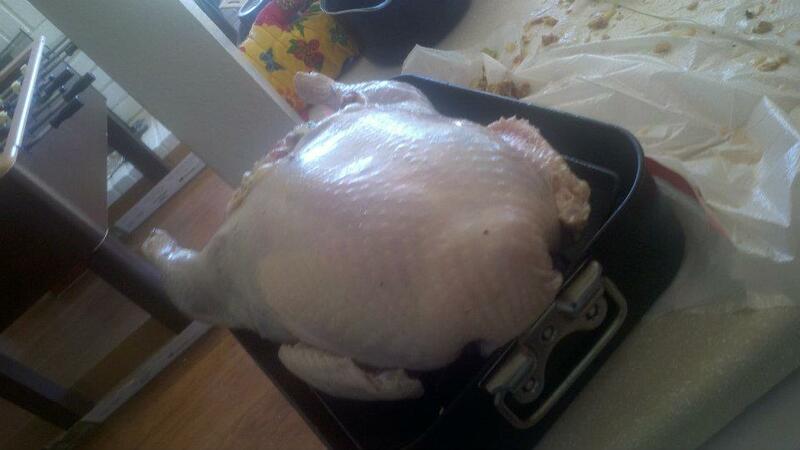 Every time I do this I have to remember which was is the spine and which way is the front of the chicken. Picture on the left shows you where the breast is. Don’t have that side up. You want the wing tips facing down, like in the picture on the right. 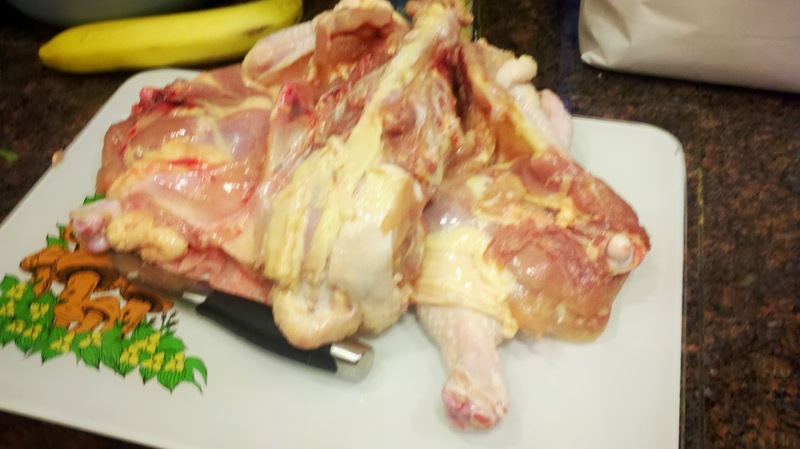 Then you do step 1: straight cut down the spine of the bird. I generally do two parallel cuts, one on either side of the spine, and then enlarge those cuts to reveal the rib cage inside. 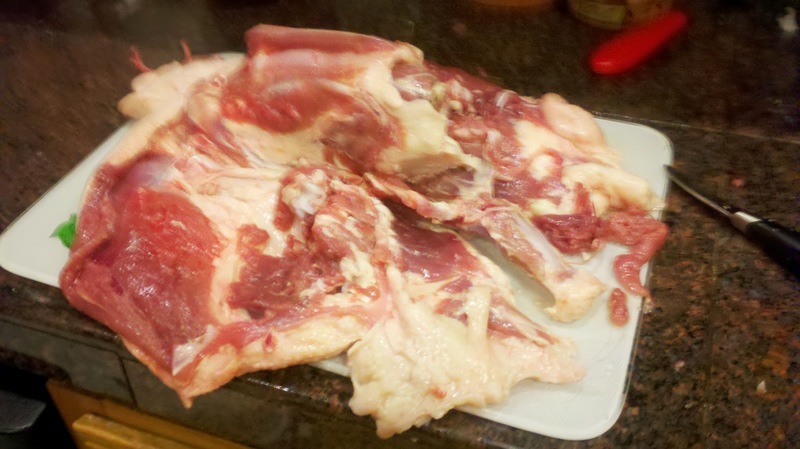 The first picture shows you what it looks like when you scrape along the rib cage after that initial slice on one side. Note the ball joint in the bloody lower right corner: you have to separate that while you do your first scraping. You can see that I use a small paring knife for all of the carving because it’s more precise. The second picture shows what happens when you do that scraping to both sides. Sorry for the blur in this series. These two pictures are me pulling the entire rib cage/carcass out of the bird. 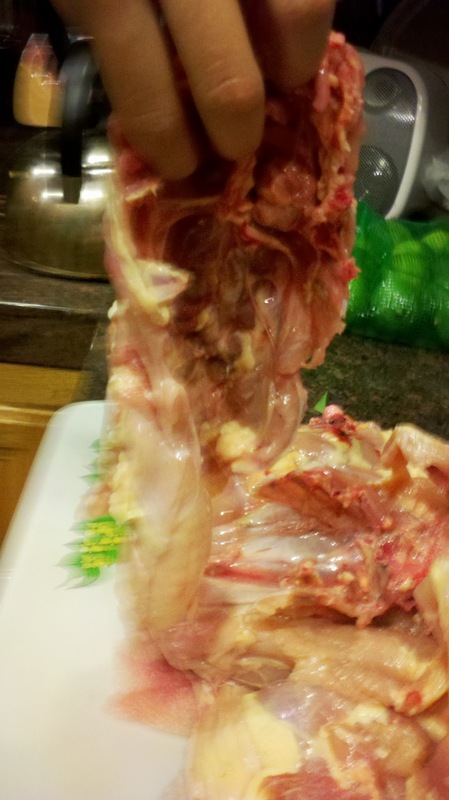 This happens right after the last two pictures: you cut all along the rib cage, and boom the whole thing just pops out. Throw your carcass in your stock pot, and turn back to the task at hand. 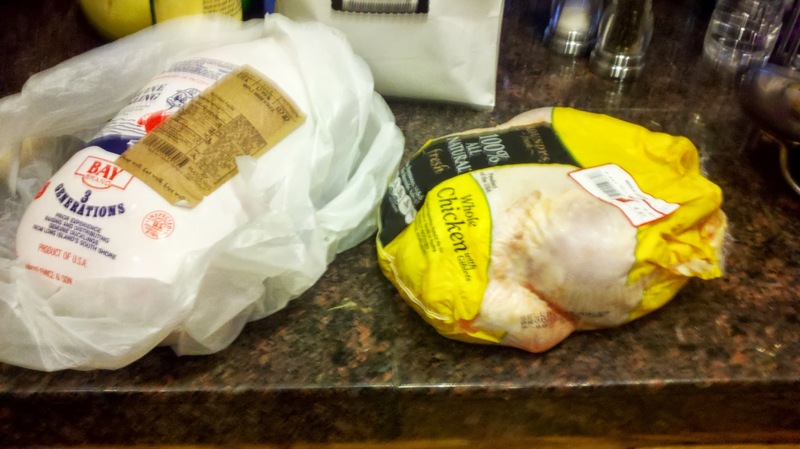 The duck and turkey have identical first steps to the chicken (what we’ve just done). I’m lacking pictures for the rest of the steps because I got sick of constantly having to stop, wash my hands, take a picture, put away my camera, and get back to it. But really, after you’ve done these first steps, your instincts will be honed and you’ll just start hacking away at steps 3-6. Then you’ll have the beauty below. I think, but I’m not sure, that this photo is the chicken. It could also be the duck. Note that you should cut off as much of the excess duck fat as you can (there’s a lot in the neck area)- it’s really not that tasty inside the turducken and is much better as crackling or rendered for duck fat. These two are just photos of step 1-2 again, but with another bird.